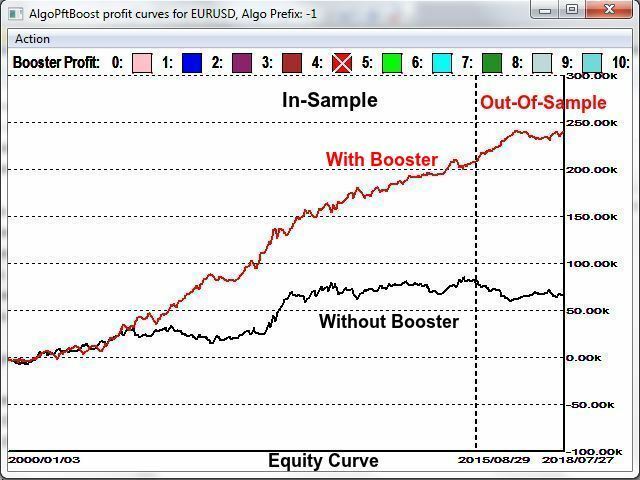 The purpose of the Algo Profit Booster tool is to try to boost the profit-performance of any Expert Advisor that has at least one optimizable input variable. It applies equally well to Expert Advisors are highly profitable on out-of-sample data, as well as ones that perform poorly. Both developers and users of Expert Advisors alike might benefit from this tool. Typical algorithmic trading involves a set of input parameter values, often pre-optimized, that remain static during trading in real-time even when underlying market characteristics may be changing. This tool introduces a paradigm shift. It works by dynamically adapting and changing the parameter values, while trading in real time, using a intelligence knowledge base “learned” earlier. No more trading with fixed input parameter values. This is a multi-part software package of which only the MQL library element is included in this product. The rest of the package is free and must be downloaded. A link to the download page will be provided after purchase. A complete User Guide is included in the download package. User doesn't need to write any MQL code to use the APIs provided by this library. All the necessary code is generated by an MQL code generator utility included in the download package. To achieve its objective, the expert advisor code is augmented with additional code to analyze and capture essential intelligence during analysis and learning phases. Both feature set options are identical in functionality, only differs on how many instances (charts) can be active at a time when trading with it. The Single-Instance version can be active with one Expert Advisor on one chart at a time, whereas the Multi-Instance version has no restrictions. This particular product is for MetaTrader 5 and for the Single-Instance version. After purchase please send me a chat message or an email to the "Contact Us" link at expertprofitbooster.com and I will provide you with a link to the download page for the companion package. Note: If APB_EA_Booster_SI.ex5 file is found in MQL5/Experts/Market folder, it must be manually moved to the MQL5/Libraries folder. The following result is from an actual test after applying the booster tool on “Simple Moving Average crossover” Expert Advisor on EURUSD, Daily. Note that even though the booster does well in the in-sample period also, this is of no significance. What matters is the out-of-sample performance. Refer to the User Guide for more details. Even though the example above is from an actual test, it is presented here for illustration purpose only. It is not a recommendation for any specific Expert Advisor.